The LT-42DV1BJ is a daringly styled, ultra-thin LCD TV that's filled to bursting with features. Put your hands together for JVC's latest top-tier 1080p flatscreen. The five stars is more in recognition of JVC's spirit of optimistic innovation and cram-it-all-in philosophy than of the success of some of the various bells and whistles. The most pertinent piece of spec is, of course, the full HD panel, although it's no longer cause for undue amazement. 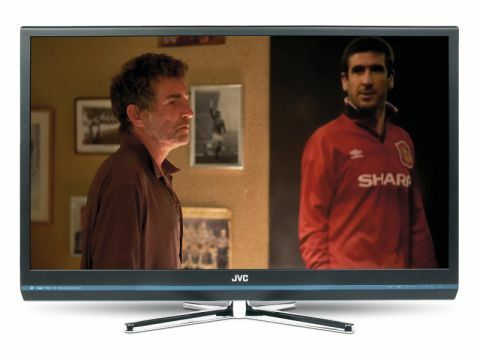 The panel electronics are where great sets are made and this one boasts the latest version of JVC's DynaPix HD suite. Earlier incarnations of this image 'engine' have been perfectly competent, while presenting no threat to Panasonic's V-real or Philips' Perfect Pixel systems at the top of the pecking order. JVC has thrown in a staggeringly high claimed dynamic contrast ratio (a million to one), setting up high expectations for the black levels. Three HDMIs looks rather miserly, meanwhile, and the company has done away with lesser ports such as S-video and composite video entirely. At the more frivolous end of the spectrum, the set is controlled via a fingerprint-attracting touchscreen that's mildly diverting, but the real news here is a handclap control function. Clapping three times turns the screen on or off, while twice operates the mute setting, which should delight anyone building the futuristic home of Tomorrow's World in the late 1970s. It doesn't seem to work every time and quite why clapping your hands to mute or turn off the telly was deemed any more convenient than, say, pressing a button on a remote control is beyond us. We suspect that most people will give it a go for the hell of it, show their mates once for a laugh and then turn it off for good. The JVC also sports an 'eco' power-saving mode for those bothered by environmental issues, but not sufficiently so as to entirely forego buying themselves a giant flatscreen in the first place. The JVC certainly looks the part, with a snazzy sliver of a remote control and a pleasantly rendered graphical user interface, but this is just a thin veneer on a slightly cack-handed system. The installation sequence takes an age, changing between channels is frustratingly sluggish and the menus are not quite as cleverly designed as they think they are. Video performance is decent, though hardly spectacular. Freeview, as we've come to expect, is fairly hideous, with poor edge discipline and clumsy gradation leading to wobbly outlines and mottled, blotchy complexions all round. Provided you don't expect any miracles and sit a sensible distance away from the set, you won't have too many problems, though. Playing DVDs shows off the TVs talents to a degree; at least it gives all those pixels something to work with and pays off handsomely in the detail department, while colours take on a much more natural, evenly blended aspect. High-definition broadcasting looks good, but isn't quite the step-up from DVD you might have hoped for, with a degree of digital noise still discernible now and again and a slight softness that occasionally looks more like astutely-scaled standard-definition rather than eyeball-boggling 1080p. Motion is pretty juddery, with natural movement marred by visible stepping, but it's not significantly worse than average on LCD. The main failing is a disappointingly feeble way with blacks. Quite how the company arrived at that whopping contrast ratio figure is a mystery because, while peak whites are pretty scorching (sometimes overly so), blacks rarely delve deeper than darkest grey. There is also very little in the way of gradation between varying shades, as witnessed by Harry Potter's wait for the Knight Bus in the Prisoner of Azkaban, in which a large amount of detail (particularly around the slavering dog-thing in the hedge) is lost to the general murk. Still, the backlight is at least consistently distributed, thereby avoiding the distracting pooling effect that has plagued some other LCD sets we've seen recently. Audio performance is reasonably faithful, but cranking it more than halfway up the slider tends to result in a bit of a shouty din. It's fine with television broadcasts, but soon finds its limit with more complicated movie soundtracks, proving unable to replicate adequately any real sense of depth. The price isn't bad, but we can't help feeling that the same set, without those daft features and sold cheaper, might have been a rather more tempting proposition.